The picture here is typical of those of Scott Morrison. You've probably already made up your own mind about him. Compare him to the previous member for his seat of Cook, in southern Sydney. I did for the Canberra Times . . .
For a politician, Bruce Baird was a pretty terrific individual. I first came across him in 1987, when he was a Liberal frontbencher in the New South Wales State parliament. He later became an excellent state Minister (for Transport and Tourism) and later, as deputy, was spoken about a putative premier. Instead, moved to Federal politics in 1998. Time passed, but there never seemed to be room for Baird in the Ministry. For a while you could believe the excuses, that maybe he was from the wrong state to be promoted. But after a while it became obvious. Howard just didn't like him. Perhaps Baird was too left-wing; or perhaps the PM was just concerned that having someone effective in the ministry would show up his favorites as incompetents, like the then Tourism Minister Jackie Kelly. It was just a matter of time before she self-destructed, although no one could predict she would achieve this so spectacularly on radio during the 2007 election campaign. The point is; Baird was never promoted. Too much personal integrity. His seat, Cook, was named after the Captain who landed there in 1788. It last returned a Labor member in 1974. People in the shire like ‘Stralya just the way she is. That’s why there was quite a contest to represent the southern Sydney electorate when Baird retired. After a number of twists and turns, Scott Morrison emerged the victor. I had to begin this column discussing someone else, because pretty well everyone's knows what they think about Morrison. This is why it's worth re-examining him as dispassionately as possible. Think of this as an exercise in working out what makes people tick; makes them successful; or, if you prefer, in the banality of evil. Morrison demonstrated he’s no intellectual slouch before becoming a politician. While he was director of Tourism Australia there’d been a disagreement with his then minister, Fran Bailey. Although a strong candidate with an MBA, Michael Towke, overwhelmingly won the pre-selection, after a bitter internal campaign went public the party hierarchy imposed Morrison in the seat amid claims of irregularity. Perhaps it was felt that a Lebanese Australian like Towke might struggle to win in the Shire. 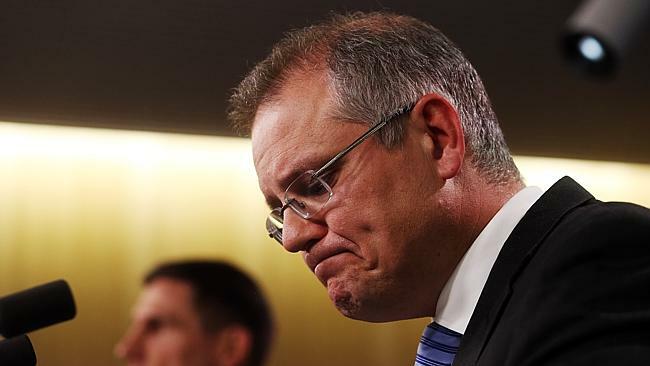 The point is, Morrison has never been a stranger to controversy but demonstrated capacity. Tony Abbott promoted him to Immigration in opposition. He took on the same portfolio in government. Since then he's become the bête noire (black beast) of every right-thinking Australian citizen, because he's the man responsible for the implementation of policies that are, quite intentionally, inhumane. Blow away the shimmering veil of pretence both sides of politics wrap around what's actually happening on Manus Island and it’s obvious. It was established as a deterrent; a “hell hole”. So let's be crystal clear, bipartisan and analytical about this. Rudd reopened the refugee trail by promising succor to the persecuted. As usual, he was out of his depth dealing with policy matters. He had no concept of the strain arriving asylum seekers would put on his prime ministership. His own party sacked him. Julia Gillard was even more incapable of finding a solution. Labor returned to Rudd. He created a vicious regime, intended to do simply one thing. Stop the boats. There was some evidence the policy had begun to work by the time Rudd was booted out last year. It's definitely kicking in now. It is inhumane and quite possibly illegal under international law: otherwise the boats would simply keep coming. And that brings us back to Morrison. He comes across, on television, as a bit dim. Perhaps that's the way he wants it. He’s not. He’s acutely aware of what he’s doing. As long as he repeats the mindless slogans and pretends he doesn't quite understand questions, he can get away with obfuscation and avoiding providing the detail that might scupper the government's threadbare veil of legitimacy. This is quite a skill. Lieutenant General Angus Campbell, for example, apparently can't manage it. He’d done okay with smoke and mirrors, justifying the deployment in Afghanistan. It must have seemed a reasonable assumption that he'd be able to do the same for Operation Sovereign Borders and providing the much-needed buffer for the government. This was meant to be a double act. Now Campbell’s gone missing in action. perhaps he’s just too upright to obfuscate. But there is a real skill required to accomplish what Morrison’s managing to achieve. Yesterday on these pages it was asserted we could actually ‘know’ certain facts about what’s happening on Manus. I think that’s crap. We don’t have any idea. We can’t begin to comprehend the dynamic inside the camp between asylum seekers from different countries; we don’t even know what the relationship is like between the Australian staffers (living on a boat off-shore) and G4S; we don’t understand how ‘the locals’ feel (as if they all feel the same way); and we certainly don’t have a clue about the way the PNG Riot Squad operates (just a hint, though, their tactics make the fiercest ACT police look warm and cuddly). Morrison has, however, learned from another story about asylum seekers that got about during the 2001 election campaign. Every politician understands that the initially released version of the ‘facts’ defines (or ‘frames’) the situation. This depicted a riot that was initiated by the asylum seekers. The idea was put about that the disturbances were nothing to do with management. Almost immediately this was challenged, but not before it had taken hold as the official definition of what occurred. Morrison’s now backtracking – but this doesn’t matter. When people are offered two conflicting and complicated versions of an event they’ll either accept the one according with their prejudice, or ignore it altogether. Which is just what Morrison wants. Actually Bruce Baird 'retired' from the seat of Cook after it became obvious he'd lost the numbers in the Liberal branches in his electorate and would not be preselected for a further term. He was also strongly aligned with small 'l' liberals, mainly Victorian MPs who openly contested some of Howard's policies.